"A fantasy that leaves the viewer free to speculate, this film touches on the theme of solitude. A woman drowns, unnoticed by three men sitting with their backs to the sea. Two of them are throwing dice; the third is drinking a glass of water. An animation film without words based on a short story by Roch Carrier." "Avec La Plage, on pénètre dans l'inconscient. Une femme se noie dans la mer tandis que, simultanément et tout proche, un solitaire anticipe la scène pendant qu'un couple joue insoucieusement aux dés. Parabole des solitudes et des destins qui n'arrivent pas à se rencontrer même s'ils se devinent." National Film Board of Canada. "NFB -- La Plage." National Film Board of Canada. 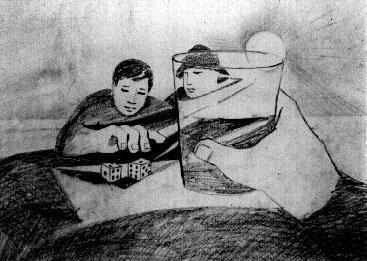 http://www.onf-nfb.gc.ca/eng/collection/film/?id=13416. Office national du film du Canada. "ONF -- La Plage." Office national du film du Canada. http://www.onf-nfb.gc.ca/fra/collection/film/?id=892.